Acoustic or electric guitars for a start? It’s no news that playing a musical instrument has many benefits. People have embraced such hobbies out of curiosity, a pure interest in music, or out of a simple desire to use their intellectual capacities in a different way. 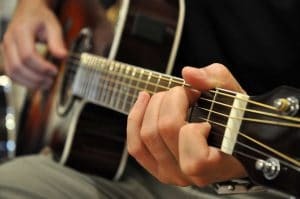 No matter the reason behind your wish to learn to play the guitar, getting started is easier now than some decades ago. If before the Internet era you had to find a professional and take lessons the classic way, today’s technology allows people to do so from the very comfort of their home. You can now find online lessons including videos and written materials with ease. Instead of driving to some guitar school, you can now save that time and actually play. Plus, some memberships are just $20 per month or so, yet you get unlimited access to an entire library of lessons and materials. Even so, the great offer you can access with just a few clicks might prove to be intimidating. As a beginner, finding the right courses from a reliable source may involve lots of time and browsing. To help you get one step closer to the courses you need, we have highlighted below key factors and various popular sources to take into account. Given the rich offer of online courses, we could easily say that guitar players are lucky today. Once you’ve purchased the guitar you wanted, you can start learning right away. It takes just a few clicks to enjoy advice and tips from professional players. Even if you have no prior experience in this field, there are lessons that will make it relatively easy for you to learn the basics of this instrument. Now, the clever trick is to separate the wheat from the chaff and start your journey the professional way. Unfortunately, considering the ease with which you can upload videos, anyone with a guitar can offer such lessons, yet that doesn’t mean that all guitar teachers are actually qualified. That’s why we’ve made our research and concluded that the following online courses are worth considering. One of the most popular and appreciated sources is offered by Guitar Tricks. The membership-based website has been around for quite some time now, which confirms the quality of its lessons. The good thing is that it offers a step-by-step system so you can advance the easy and fun way. Moreover, it offers the possibility to have a one-on-one video lesson with an instructor, which can prove to be crucial at some point in your guitar journey. 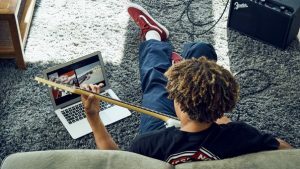 Similar to Guitar Tricks, JamPlay is worth considering as well since it covers a wide range of needs, master courses, and even live lessons from world-class teachers. Just like the previously mentioned website, this one offers free trials so you can see if that’s what you need and like. You will also find a rich library of songs in every genre and lessons that will help you learn each part easily. In case you’re interested in free online courses, the first option that comes to mind, as a result of its popularity, is Justin Guitar. By offering YouTube-based video lessons, Justin Sandercoe helps newbies as well as more advanced players explore this realm in a fun way. What’s great about it is that it is completely free, so you can indulge in this hobby without breaking the budget. Sure, there are many other websites and resources such as apps that deserve attention. We have selected the ones mentioned above based on the lesson structure offered, song library, playing levels covered, and, of course, the feedback received from the players who actually tried them. The answer depends on how serious you are about playing the guitar. If it’s an activity you will go for just now and then, a free option such as Justin Guitar might do it. However, if you plan to get good at this and you don’t intend to play just for fun when there’s nothing else to do, considering a paid course is a smart step to take. Paid memberships usually include carefully structured programs that will help you not only learn but also improve without losing motivation. Plus, some of them offer the possibility to learn from a qualified instructor or get feedback from one, which is of tremendous help if you’re seriously involved in this. Such resources cover the natural steps of guitar playing, helping you get from easy to challenging without affecting the fun it should be about. Then, there’s the great variety of songs and genres they offer, so you can find your own style while learning. Not to mention the possibility to check your progress and divide your adventure into achievable goals. It depends on what you want. This is a question all beginners need to find an answer to. 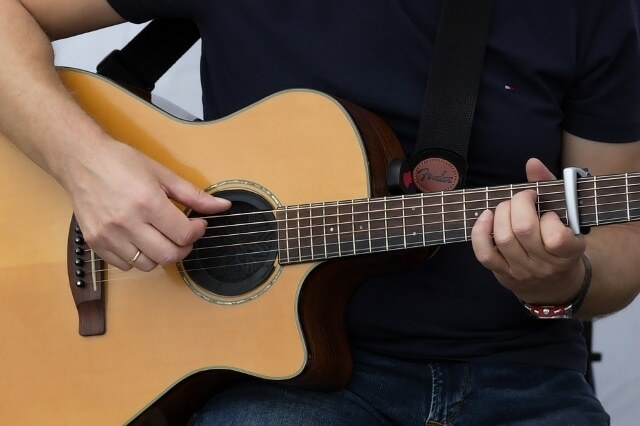 Many teachers and musicians would say that learning acoustic guitars may be better for beginners for a variety of reasons. One would be that playing such a guitar requires greater strength and that there is no distortion or effect that would cover your sonic mistakes. This way, you can hear what you play and take the steps needed to correct that. Plus, playing the electric guitar once you’ve learned to play an acoustic one is easier. Then, there are many musicians who started on a beginner electric guitar and did so well. In case you’re more into genres that rely on such guitars, then getting a starter electric guitar is perhaps the thing to do. The wealth of resources available on the web might confuse a beginner and make this first stage of guitar playing difficult, although it shouldn’t be so. Think of how committed you are to learning this instrument and choose accordingly. Once you do so, just stick to the program you’ve selected and the results won’t fail to appear.